The Diabetes Control and Complications Trial has demonstrated that intensive insulin therapy and the resultant tight glycaemic control delays microvascular complications in adolescents with Type 1 diabetes mellitus (Type 1 DM)., Intensive therapy using multiple daily insulin injections with frequent self-monitoring of blood glucose (SMBG) has become a standard in management of Type 1 DM. However, major problem with intensive therapy is increase in risk of severe hypoglycaemia and recent data suggest that severe hypoglycaemia in children with Type 1 DM may be associated with cognitive dysfunction.,, SMBG done 4 times a day does not provide a complete picture of blood glucose trends. Another major shortcoming of SMBG is its failure to detect hyperglycaemic events as well as nocturnal and asymptomatic hypoglycemia despite good glycaemic control.,,, Furthermore, other factors such as needle phobia, pain and inconvenience contribute to poor compliance to SMBG. Significant efforts have been made for the development of accurate and feasible devices for continuous glucose monitoring. The US, Food and Drug Administration (FDA) has approved real-time continuous glucose monitoring systems (CGMS) for clinical use in patients with T1DM, but none is available in India and are very costly for Indian standards. However, FDA approved professional (or blinded) continuous glucose monitoring system (P-CGMS), owned by healthcare professionals, is available in India. It is indicated for selected patients with T1DM having poor glycaemic control to guide insulin dosing to diagnose hypoglycaemic unawareness, nocturnal hypoglycaemia and Somoygi/Dawn phenomenon. Although professional CGMS has its own limitations, it is semi-invasive method of glucose measurement where in glucose sensor placed subcutaneously measures interstitial fluid glucose level. Professional CGMS needs to be applied for at least 3–5 days to get retrospective trends of glucose variability which help physicians in guiding further insulin therapy more efficiently. It has been validated in several reports, and has shown to provide very good correlation between blood and interstitial fluid glucose levels.,, There is only one study recently published from India on feasibility and use of P-CGM in children with T1DM. However, this study was conducted using different type of P-CGM called Freestyle Libre Pro™ Flash Glucose monitoring system. The iPro™2 Professional CGM is available in India for many years now, but there are no Indian studies until date regarding its feasibility and acceptability in younger children with T1DM. Hence, this study was planned to assess the feasibility and acceptability of iPro™2 Professional CGM in children with T1DM in Indian scenario. This prospective observational study was conducted at Paediatric Diabetes clinic at a tertiary care Paediatric hospital in northern India. The study was conducted over a 2-year period (January 2014 to December 2015) during which 42 children with type 1 DM (2–10 years old), having poor glycaemic control, were enroled after informed consent from parents/caregivers. Study protocol was approved by the Institute Ethics committee. Our centre owns iPro™2 Professional CGM and cost of the sensor was borne by the study investigators. All children enroled, were placed on P-CGM (iPro™2 Professional CGM, Medtronic, USA) for 3–5 days and finger-prick blood glucose monitoring by glucometer (SMBG) at least 3–4 times/day was continued. P-CGMS was applied on each patient by the clinician in the Paediatric Diabetes unit (after proper training). P-CGM (sensor with attached recorder) was applied in out-patient clinic, with patient in supine position under strict aseptic precautions, over abdomen in medial lumbar region. All steps of applying P-CGMS were followed as recommended by the manufacturers, details of which can be seen on their web site. After application of P-CGM participants were sent home explaining all necessary precautions and advised to continue their usual daily activities as before as well as monitoring of glucose by SMBG with their own glucometers before meals and at bedtime. They were advised to return back after a period of 3–5 days according to their convenience. Patients were encouraged to follow their regular lifestyle and treatment during this monitoring period. Patients/parents were also instructed to record daily activity, meals, snacks and other relevant information with exact time that could potentially affect glucose levels in body. Record of timing and doses of insulin injections was also maintained. All above information was recorded on a patient log sheet by caregiver. Information with respect to duration and timing of wearing of P-CGM, any problems occurring in wearing P-CGM (like proper fitting, local irritation or redness/pain), reasons for removing P-CGM if at all, any restriction in daily activities of the child (as told by parents/child) was also noted. P-CGM was removed in the clinic after 3–5 days by the investigator. The reports were generated after uploading data to computer using therapy management software. Acceptability of professional CGM was assessed with the help of semi-structured questionnaire that included patient/parent satisfaction factors and adverse events related to P-CGM. Feasibility was assessed using standard objective parameters, namely, number of calibrated paired glucometer readings per day, mean absolute difference (MAD) and correlation coefficient between sensor and glucometer readings which are generated by the software used for preparing the P-CGM reports. Technical feasibility was assessed collecting information regarding accidental removal, fixing problems, total duration and completeness of the intended duration of P-CGM. A total of 42 children underwent P-CGM, with Male: female ratio of 1:1. The median age of children undergoing P-CGMS was 70.02 ± 25.30 months with a range from 2.5 to 9.8 years. The average duration of T1DM was 12 months (range 6–35 months) and average haemoglobin A1C over the last 6 months was 8.01 ± 1.46%. All (except two patients on split mix regular-NPH insulin regimen) were on basal-bolus insulin regimen with insulin analogues and were taking at least four insulin shots per day and checking blood sugars (SMBG) for at least 3 times/day. Average insulin dose being received was 1.12 ± 0.36 Units/kg/day. Acceptability was assessed by collecting data regarding local reactions (including pain, irritation, redness, swelling, bleeding), sleep disturbance (of child/parent), restriction of routine activities and parental anxiety/apprehension during P-CGM. Most common adverse events were local irritation in 16 (38.1%) children, parental apprehension/anxiety reported in 12 (28.5%) cases followed by local redness observed in 11 (26.2%) children. Major adverse events like bleeding at the local site or hindrance of daytime activities (playing and schooling) was not observed in any child [Table 1]. A total of 47 sensors (disposable component of the CGMS) were used for 42 patients enrolled in the study. Of the five extra sensors used; three patients required repeat sensor insertion as the first P-CGM recording duration was <48 h and 2 sensors were damaged as they could not be inserted properly in the first attempt and got dislodged at the time of insertion only. The average duration of recording of P-CGM was 84.6 h. Premature and accidental removal of sensor occurred in 2 (4.8%) patients among 7 (16.7%) children who had problems of fixing and stability of p-CGM. Minimum of 3 calibrated paired glucometer readings (SMBG) per day were taken as acceptable for data quality and was seen in 40 (95.2%) children. Other parameters for acceptable data quality like, MAD of <28% was seen in 35 (83.3%) and correlation coefficient of >70% was seen in 31 (73.8%) patients [Table 2]. [Figure 1] shows the first page of P-CGM report of a study participant. The full P-CGM report, as generated by therapy management software, is also provided [Supplementary File 1]. Most common abnormal glycaemic trend noted on P-CGM was post-meal hyperglycaemia (59.5% of children) followed by nocturnal hypoglycaemia (54.8% of children) and pre-meal hyperglycaemia (47.6% children) [Table 3]. Somogyi or Dawn phenomenon was not noticed in any of the children. In our study of 42 children with T1DM, professional CGM was done using iPro™2 and found to be acceptable and feasible in young children between 2 and 10 years of age. Although there was some parental anxiety documented in nearly 1/4th cases and minor local redness and/or itching in nearly 1/3rd cases, no major problems were encountered. Objective criteria of adequate data quality were fulfilled in >3/4th of children undergoing P-CGM. Common perceived/anticipated problems in young children like detachment of sensor in young overactive children, hindrance of daily activities and pain were not found to be significant in our study. A similar experience has been documented in previous studies done in children., However, Juvenile Diabetes Research Foundation study group on CGM use among patients with T1DM reported that pain in sensor insertion, skin reaction and issues related to discomfort with wearing the device were the common barriers to CGM use. Other reported factors affecting the use of CGM were reduced body surface area, ambient temperature and humidity as well as the type and duration of physical activity of the patients. Whereas in our study, high humidity and sweating during summer and monsoon seasons did not pose significant fixing issues as out of the five patients having fixing problems only two had actual premature removal of the sensor. Another Indian study in children with the use of the second type of available Professional CGMS (Freestyle Libre Pro™ Flash CGM, Abbott) reported incomplete sensor placement duration in nearly 35% of children due to either sensor detachment, or premature removal due to pain. This study also did not report any hindrance in day-to-day activities or attending school by children. This is in concordance with 38% children (13 out of 42) in our study who did not complete intended duration of placement of P-CGM. Above-mentioned Indian study on 46 children (up to 18 years of age) showed that this type of P-CGM (Freestyle Libre Pro™ Flash CGM) was acceptable and feasible even in younger children as shown in our study as well with iPro™2 CGM. Average P-CGM duration in our study was 84.6 h against the desired duration of 72–120 h compared to sensor wear of 9.3 days against desired of 14 days in Libre Pro™ P-CGM study. Youngest patient in our study was 2.5 years old who completed P-CGMS wear for 3 days and P-CGMS recording hours were 68 h with MAD 15.1% and correlation coefficient 92% suggestive of very good quality P-CGMS data recorded. Common causes of premature removal in our study was fixing problems while in Libre Pro™ study it was pain at the sensor insertion site. While discussing P-CGM reports and trends with parents and children, it was easy to make them understand the concepts of basic T1DM home management like variability of post-meal glycaemia with different types of foods, matching of insulin dose with the amount of food being eaten, the effect of physical activities on glycaemic trends, etc., In many cases, alert parents could actually pick up reasons of sugar fluctuations seen in P-CGM graphs. Parents and children could also understand that just doing premeal SMBG may not give the true glucose profile and doing more frequent SMBG will give a more accurate idea. For these reasons, P-CGM is also considered as a good education tool for these patients and their parents regarding home management of T1DM. This value of P-CGM as an educational tool for children with T1DM and their parents is well recognised and recommended in guidelines as well. Most important objective criteria considered for the quality of P-CGM data are MAD <28% which was seen in 35 (83.3%) patients in our study, and correlation co-efficient >70% seen in 31 (73.8%) in our study. This limitation of inadequate data recording due to various reasons has been reported in previous studies also.,,, In our study, 70% of available data was of good quality and could be used for interpretation and analysis of glucose trends. 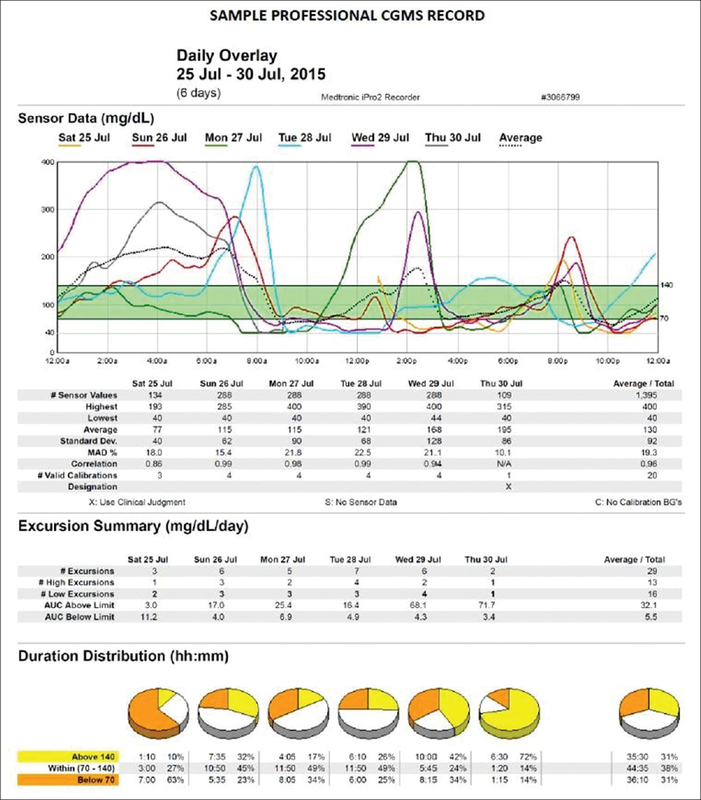 This sub-optimal data quality was due to multiple reasons including insufficient meter glucose calibrations per day (minimum 3 required/day), increased MAD (with SMBG), decreased correlation co-efficient (<70%) and absence of recording intermittently due to transient sensor dislodgement. A total of 47 sensors were used for doing P-CGM in 42 patients. Two sensors were could not be inserted properly in place on the first go and were thus wasted as the same sensor cannot be re-inserted. This technical issue happened only at the beginning of the study suggesting that it was due to initial in-experience rather than an inherent problem of sensor application. Three patients required repeat CGMS application due to the recording of data for <48 h.
In our study, we assessed patient's satisfaction (acceptability) with CGMS (by a semi-structured objective questionnaire) and found that patients and parents were satisfied with the device and recommended its use to other patients suggesting that patient/parent's satisfaction with CGMS was high. The motivation of parents and family is important as analysis of the glucose trends on P-CGM is only possible if parents are willing to maintain a good record of all the diet/snacks taken, activities, SMBG records, etc., during the days of P-CGM. We detected nocturnal hypoglycemia in nearly 55% of patients using P-CGM who were otherwise asymptomatic. It is well recognised that interstitial glucose value (measured by CGMS sensor) is usually 10%–15% lower than blood glucose and CGMS thus reflects lower than true blood glucose especially at low blood glucose., This could be an explanation for a high percentage of patients having asymptomatic nighttime hypoglycaemia observed in our study. Other important additional information (compared to SMBG) was the detection of post-prandial hyper- and hypo-glycaemia which would have been missed on four standard SMBG records in a day (3 premeal and one bedtime). Although P-CGM use seems feasible and acceptable in children with T1DM, regular use on a day-to-day basis may not be possible due to significant cost in developing the world. The cost of doing P-CGM (iPro 2™) is nearly 2500 INR for a single sensor which works for a maximum of 7 days. P-CGM recorder to be purchased by health professional/hospital has a one-time cost of nearly 70000 INR which can be used for 1–2 years for 50–70 patients. Our observations (unpublished data) suggest that prescription of P-CGM for 3–5 days in selected patients with poor glycaemic control may improve glycaemic control over following 3 months. Hence, in resource-poor countries intermittent use of P-CGM every 3-6 months may help to guide therapy and improve glycaemic control. There are very limited awareness and use of Professional CGMS in Indian children with T1DM, and there is scarce published data for the same. This study will serve as first documented data on the use of Professional CGMS using iPro 2™with regards to its feasibility and acceptability in children. Further, as per existing literature, there are some reservations in use of Professional CGMS in children <6–8 years. The study has amply shown that it is feasible and acceptable even in younger children. The youngest patient in our study was 2.5-year-old who had a duration of CGMS wear for 3 days and CGMS recording hours were 68 h with MAD 15.1% and correlation– coefficient 92% suggestive of very good quality CGMS data. We conclude that P-CGM using iPro 2™ is both feasible and acceptable to children (2–10 years) with T1DM as well as their caregivers and does not have any significant adverse effects. However, clinical efficacy and cost-benefit analysis of P-CGM in improving glycaemic control in children with T1DM in resource-constrained countries need to be explored in large randomised trials. This study was partially support by Intramural Research Grant from PGIMER, Chandigarh. Effect of intensive diabetes treatment on the development and progression of long-term complications in adolescents with insulin-dependent diabetes mellitus: Diabetes control and complications trial. Diabetes control and complications trial research group. J Pediatr 1994;125:177-88. Hershey T, Lillie R, Sadler M, White NH. A prospective study of severe hypoglycemia and long-term spatial memory in children with type 1 diabetes. Pediatr Diabetes 2004;5:63-71. McCarthy AM, Lindgren S, Mengeling MA, Tsalikian E, Engvall J. Factors associated with academic achievement in children with type 1 diabetes. Diabetes Care 2003;26:112-7. Hannonen R, Tupola S, Ahonen T, Riikonen R. Neurocognitive functioning in children with type-1 diabetes with and without episodes of severe hypoglycaemia. Dev Med Child Neurol 2003;45:262-8. Boland E, Monsod T, Delucia M, Brandt CA, Fernando S, Tamborlane WV, et al. Limitations of conventional methods of self-monitoring of blood glucose: Lessons learned from 3 days of continuous glucose sensing in pediatric patients with type 1 diabetes. Diabetes Care 2001;24:1858-62. Chase HP, Beck RW, Xing D, Tamborlane WV, Coffey J, Fox LA, et al. Continuous glucose monitoring in youth with type 1 diabetes: 12-month follow-up of the Juvenile diabetes research foundation continuous glucose monitoring randomized trial. Diabetes Technol Ther 2010;12:507-15. Deiss D, Hartmann R, Schmidt J, Kordonouri O. Results of a randomised controlled cross-over trial on the effect of continuous subcutaneous glucose monitoring (CGMS) on glycaemic control in children and adolescents with type 1 diabetes. Exp Clin Endocrinol Diabetes 2006;114:63-7. Kaufman FR, Gibson LC, Halvorson M, Carpenter S, Fisher LK, Pitukcheewanont P, et al. Apilot study of the continuous glucose monitoring system: Clinical decisions and glycemic control after its use in pediatric type 1 diabetic subjects. Diabetes Care 2001;24:2030-4. Gross TM, Bode BW, Einhorn D, Kayne DM, Reed JH, White NH, et al. Performance evaluation of the MiniMed continuous glucose monitoring system during patient home use. Diabetes Technol Ther 2000;2:49-56. Mastrototaro J. The MiniMed continuous glucose monitoring system (CGMS). J Pediatr Endocrinol Metab 1999;12 Suppl 3:751-8. Rebrin K, Steil GM, van Antwerp WP, Mastrototaro JJ. Subcutaneous glucose predicts plasma glucose independent of insulin: Implications for continuous monitoring. Am J Physiol 1999;277:E561-71. Schmidt FJ, Sluiter WJ, Schoonen AJ. Glucose concentration in subcutaneous extracellular space. Diabetes Care 1993;16:695-700. Sternberg F, Meyerhoff C, Mennel FJ, Bischof F, Pfeiffer EF. Subcutaneous glucose concentration in humans. Real estimation and continuous monitoring. Diabetes Care 1995;18:1266-9. Medtronic iPro2 CGM User Guide. Available from: https://www.medtronicdiabetes.com/sites/default/files/library/download-library/user-guides/iPro2-with-Enlite-User-Guide.pdf. [Last accessed on 2017 May 21]. CareLink iPro Therapy Management Software for Diabetes – User Guide. Available from: https://www.medtronicdiabetes.com/sites/default/files/library/download-library/user guides/CareLink_iPro2_User_Guide-en-US.pdf. [Last accessed on 2017 May 21]. Lagarde WH, Barrows FP, Davenport ML, Kang M, Guess HA, Calikoglu AS, et al. Continuous subcutaneous glucose monitoring in children with type 1 diabetes mellitus: A single-blind, randomized, controlled trial. Pediatr Diabetes 2006;7:159-64. Juvenile Diabetes Research Foundation Continuous Glucose Monitoring Study Group, Beck RW, Buckingham B, Miller K, Wolpert H, Xing D, et al. Factors predictive of use and of benefit from continuous glucose monitoring in type 1 diabetes. Diabetes Care 2009;32:1947-53. Englert K, Ruedy K, Coffey J, Caswell K, Steffen A, Levandoski L, et al. Skin and adhesive issues with continuous glucose monitors: A sticky situation. J Diabetes Sci Technol 2014;8:745-51. Blevins TC. 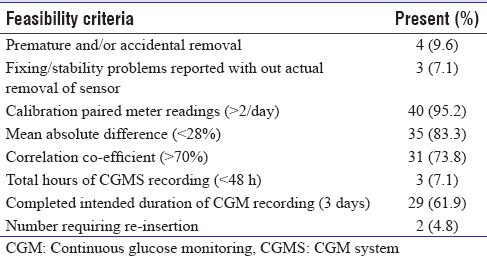 Professional continuous glucose monitoring in clinical practice 2010. J Diabetes Sci Technol 2010;4:440-56. Ludvigsson J, Hanas R. Continuous subcutaneous glucose monitoring improved metabolic control in pediatric patients with type 1 diabetes: A controlled crossover study. Pediatrics 2003;111:933-8. Chico A, Vidal-Ríos P, Subirà M, Novials A. The continuous glucose monitoring system is useful for detecting unrecognized hypoglycemias in patients with type 1 and type 2 diabetes but is not better than frequent capillary glucose measurements for improving metabolic control. Diabetes Care 2003;26:1153-7. Schaepelynck-Bélicar P, Vague P, Simonin G, Lassmann-Vague V. Improved metabolic control in diabetic adolescents using the continuous glucose monitoring system (CGMS). Diabetes Metab 2003;29:608-12. Djakouré-Platonoff C, Radermercker R, Reach G, Slama G, Selam JI. Accuracy of the continuous glucose monitoring system in inpatient and outpatient conditions. Diabetes Metab 2003;29:159-62. Monsod TP, Flanagan DE, Rife F, Saenz R, Caprio S, Sherwin RS, et al. Do sensor glucose levels accurately predict plasma glucose concentrations during hypoglycemia and hyperinsulinemia? Diabetes Care 2002;25:889-93. Sachedina N, Pickup JC. Performance assessment of the medtronic-miniMed continuous glucose monitoring system and its use for measurement of glycaemic control in type 1 diabetic subjects. Diabet Med 2003;20:1012-5.